My conversion to Jesus Christ took place in 1980, in a leafy little town called Parys (Afrikaans for “Paris”) situated on the banks of the Vaal River that runs through the Free State in South Africa. I had heard testimonies of the indescribable bliss that comes with being “born again”, but my experience was somewhat different. My particular conversion left me with a knot on my stomach. You know that feeling you get when you hear your puppy has been run over? Well, that’s more or less what it felt like. For four, long torturous years. I realized that I had to do something, and so I did the obvious: I sought help from fellow Christians. I quickly learned that you don’t have to go far to find a saved soul who would gladly offer spiritual assistance to a fellow believer in distress, such as myself. I enrolled at Bible college in 1983, where I shared my predicament with two prominent lecturers. They decided that I needed deliverance from the knot, and invited me to one of their sessions after hours. I happily obliged, fully convinced that no one was better equipped than these godly men to deal with the knot. A few evenings later I found myself on a chair in a deserted classroom, with a bucket strategically placed in front of me. The bucket was for vomiting, which happened to be the way many deliverance sessions were going in the early eighties. I now suspect Linda Blair’s famous exorcism scene had more to do with it than the gospels, but back then I knew nothing. And so I really tried, but I could only produce a few feeble burps. These initially encouraged my would-be deliverers, one of whom was assisting with rhythmic back-pats. But in the end we all just gave up. The knot did not end up in the bucket. Instead, it responded by giving itself an extra tight twist, leaving me with the distinct impression that it knew exactly what I was trying to do. The knot made me “backslide” quite regularly. It had a rather nasty habit of untying itself whenever I gave myself up to sin. Whenever I repented, which became a dramatic serial habit of mine, the knot would reappear out of the blue. And then it would stay, until I gave up again and fell headlong into sin. Of course this made absolutely no sense to me. Why on earth was I tortured whenever I wanted to please the Lord? And why was it such a blessed relief to simply give in and let my depraved nature take over? I simply could not figure it out. 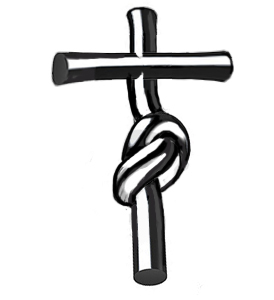 Then there was the excommunication… During one of these seasons of knot-free depravity I did something that outraged a high official of the denomination that I belonged to. In an effort to conceal the evidence of a night of sin, committed on the property of the denomination’s headquarters (where I was living at the time), I gave an unsober friend of mine directions to a fence from where he could dump the whole foul lot onto the pavement of a Johannesburg back street. To this day I don’t know how he did it (or didn’t do it), but when he finally stumbled onto a fence and fulfilled his mission, it was not the fence I had in mind. The next morning the General Secretary of the denomination awoke to find the sordid sight of the previous night’s debauchery amongst his roses. And so I was told to pack my bags. Even the gentle Dutch pastor who had baptised me a few months earlier expressed his disappointment. I left the sacred grounds and moved in with the family of a girl that I had met at the games arcade down the street. The knot was gone. At least for a while. When I joined the Army, as all young South Africans had to do at the time, the knot made me preach the Word in the week and smoke marijuana over the weekend. It finally caused me to go on AWOL, get busted, end up in military prison, repent behind bars (I still have the confessional letter I wrote) and get horribly drunk soon afterwards. It was during the autumn of 1984 that it happened. Miraculously. I was reading the book Turn Your Back on the Problem, by Bible teacher Malcolm Smith, when the lights went on and revelation flooded my soul. My mind was blown, and so it has remained for thirty years. What was the revelation? It was ridiculously simple: I had been trying so hard to live the Christian life all those years! I had been trying! I! That was the problem: I. I had tried to live the life of God, a life that he alone could live. The second I realized this the knot gave me a beautiful smile, bowed gracefully and disappeared, never to return. I was my own greatest enemy. I tried to do what God alone could do. Of course! I was never supposed to do it. That’s why Jesus Christ came to earth. To do what I could never do! Christ gave us his life because we needed it, because our lives were not, could not, work themselves out. In a flash I saw it: Christianity was the great exchange. I had to lay down my life and take up his. Christianity was not effort, effort, effort. It was resting in the completed works of God. It was allowing Jesus Christ to live his life in me, and learning to live by his glorious indwelling life. It was accepting his grace daily, and not trying to earn it. Over and over I said it: “We are first forgiven, then transformed. Not first transformed, then forgiven!” Within a matter of weeks I was freed from the addictions and instability that had plagued me for so long. Naturally, for I allowed Christ to start living his life in and through me! In the unbelievable mercy and providence of God, the next book that I picked up and started reading was Watchman Nee’s The Normal Christian Life. Here I found the Biblical explanation of the revelation that I had discovered in Smith’s book. I was a changed man, and I decided there and then to commit my life to spreading this simple message of the exchanged life and our union with Christ, a message that not a single one of the pastors, lecturers, counselors, deliverers, prophets and traveling evangelists had given me when I needed it the most. A new world had opened up for me, and the bliss was even more indescribable than I could have anticipated. In the three decades since then I have discovered that my experience was by no means unique, even though it felt so at the time. The insight into God’s unconditional love and grace, the exchanged life, our union with Christ, and, above all, the PREEMINENCE OF JESUS CHRIST IN EVERYTHING, was the very insight that revolutionized the lives of people like Andrew Murray, A W Tozer, Devern Fromke, T Austin Sparks, Ian Thomas, Norman Grubb, Roy Hession, Jessie Penn Lewis and countless others. In fact, it spoiled all other Christian books and sermons for me. And so Revien and I have no other desire in life but to lead people into this glorious knowledge of God’s perfect and utterly finished work that He Himself had accomplished in and through Jesus Christ. Truly, the joy of living by the indwelling life of Christ is one filled with inexpressible joy! *Sadly, when I walk into Christian bookstores today or consider which books top the Christian bestseller charts, I have to conclude that matters have not improved since 1984. In fact, it would appear that they have worsened. With the exception of Nee, Murray and Tozer, books on the Christ centered life are hard to come by. There are some contemporary authors who have rediscovered and are propagating the works by the authors mentioned above, and some are writing their own, but they are not nearly as influential as the “How to” motivational authors whose books sell millions of copies annually. Hi are you able to contact us privately? I would be more than happy to. Please send me a mail at bigpicture@mweb.co.za. Tobie, I was reading your story on here and decided that I had to share it with my wife, Dorothy. We both got quite a laugh over you excommunication experience. 🙂 I had a hunch about what the knot was as soon as I started reading it and I was right. I am so glad that you found those two books that God used to lead you into the exchanged life IN Christ. Even though I read “The Normal Christian Life” early on in my walk, the example of my Christian leaders drowned out the simple message of the gospel that Nee wrote about so well. Like the Galatians I started out so well, but soon became bewitched by these false leaders who put me under their own law and rules of which “listening to the Holy Spirit above” was not one of them. I am blessed to read about your freedom in Christ, my brother. I wish I had known a couple of years ago that you were in Johannesburg when we went through there. We spent almost 24 hours there while waiting for a plane to New London, East Cape. If you ever come to America I hope we can connect. Those long distant flights are a killer for me and my worn out back, but by His grace who knows where we might end up! BTW, I got to meet Norman Grubb in western Washington state when we were living there and talk with him once. He was a very tender and loving brother at a time when I felt like God had cast me out to the backside of the wilderness. Re coming to America: I am in fact planning to. I’ve written and illustrated a commentary on Romans, and I would like to see if I can find a publisher for the US market. We are busy self-publishing over here. (I am sure you know exactly what I am talking about!) So I’ll keep you posted. Would love to meet and discuss the depths of our Lord!